Southeastern Marching Band Painting FUNdraiser: "Cardinal Lamp Post"
*Proceeds benefit Southeastern Marching Band. Not eligible for coupons, discounts, or gift certificate redemption. Join us in the Miami View Cafeteria as we paint a custom "Cardinal Lamp Post" perfect for decorating or gifting! Even if you have never painted before, Lisa Bauer of the Mayflower Arts Center guides you through every step so you can paint with confidence! Canvas size is 16"x20", acrylic paints are used. Seating is limited to 36 guests. Registration is required. Space is limited to 36 people and registration is required. SOLD OUT! Fulton Farms Fall Paint Day: "Stacked Pumpkins"
Join us in the Fulton Farms Market Loft for a fun, crisp fall afternoon of painting as we create "Stacked Pumpkins" in rustic, fall colors! Great for any decor or give to someone as a gift! Even if you have never painted before, Lisa Bauer of the Mayflower Arts Center guides you through every step so you can paint with confidence! Canvas size is 16"x20", acrylic paints are used. Seating is limited to 30 guests. Pre-registration is required. Space is limited to 30 people and pre-registration is required with a ticket purchase through Brown Paper Tickets. Registration is now CLOSED. The event is SOLD OUT. 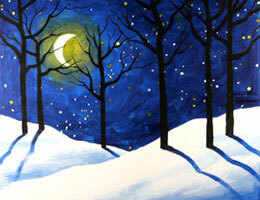 Join us for our first ever Paint for Paws FUNdraiser event on Wednesday, February 7 from 6-9pm! 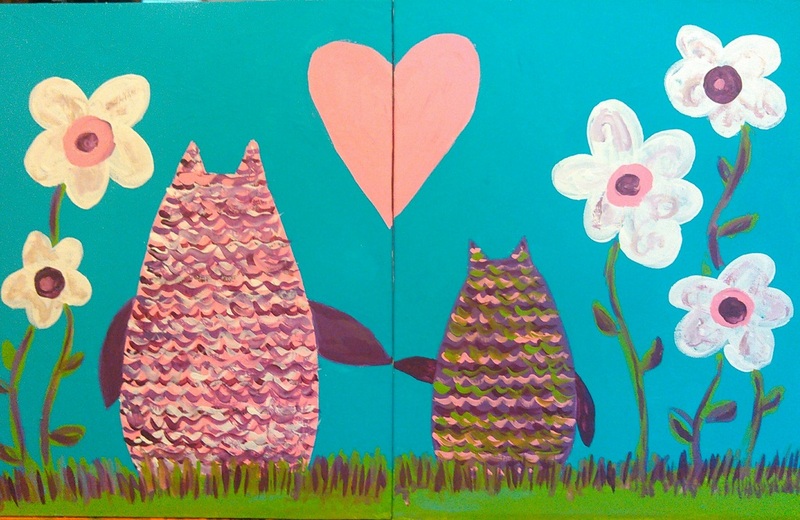 With the guidance of Lisa Bauer from Mayflower Arts Center, you will have a chance to create your very own Valentine "You Hold the Key" masterpiece on a 16x20 canvas. She will walk you through every step so you can paint with confidence! 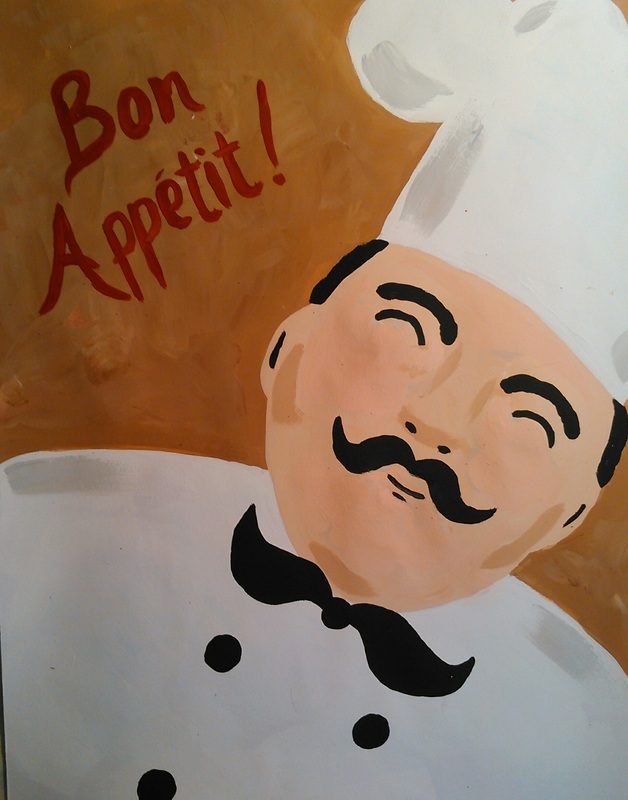 Enjoy food and libations while you paint. All proceeds will benefit Old Man's Alley Cats (trap, neuter, release and adoption program). Fee: $35/adult, includes all materials. Space is limited to 25 participants. Our Family Paint Days are a fun way to bring families together to paint and enjoy each other's company. It is a perfect for time for kids, moms, dads, grandparents, nieces, nephews, friends, and neighbors to create art together! Guided instruction walks you through every step of the project, so no experience is necessary. Space is limited to 18 total guests and pre-registration is required. 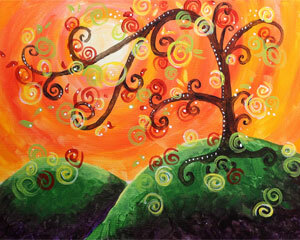 Moms, bring your little ones along with you to paint this sweet canvas! Nothing captures the love and nurturing qualities of mothers quite like a Mother Bird and her babies. We've designed this sweet piece so that one to five baby birds can be painted, for a perfectly customized piece. Guided instruction walks you through the project, so it is perfect for anyone wanting to get over the fear of putting paint to canvas. Back by popular demand! 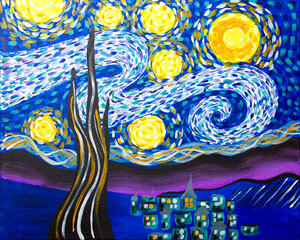 Starry Eve is a whimsical version of Van Gogh's Starry Night. Guided instruction walks you through the project, so it is perfect for anyone wanting to get over the fear of putting paint to canvas. Space is limited to 18 guests and pre-registration is required. This little bunny wants to play peek-a-boo! 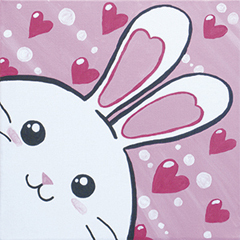 ​Parents enjoy a night out without the kids as they join us and paint this cute Valentine Hunny Bunny on a 12x12 canvas! Guided instruction walks you through this project, so it is perfect for anyone ages 5+. Cookies and punch will be served. Space is limited to 18 kids and pre-registration is required. Love padlocks are an age-old way to show your devotion to someone. 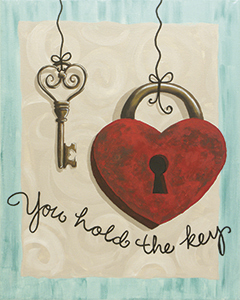 Create the same sentiment with this lock and key painting. Add your names to the heart lock to seal your fates together for a personal touch. Guided instruction walks you through the project, so it is perfect for anyone wanting to get over the fear of putting paint to canvas. Throughout history, the olive tree has been revered as almost holy, a symbol of peace, victory, and the endurance of life itself. 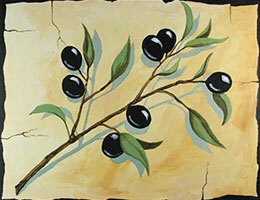 The delicate shape of the stems and leaves and the deep color of the olives make this an ideal painting to display in your kitchen. Guided instruction walks you through the project, so it is perfect for anyone wanting to get over the fear of putting paint to canvas. Guided instruction walks you through the project, so it is perfect for anyone wanting to get over the fear of putting paint to canvas. Chickadees are one of our favorite cute and cheerful birds to watch for in winter. 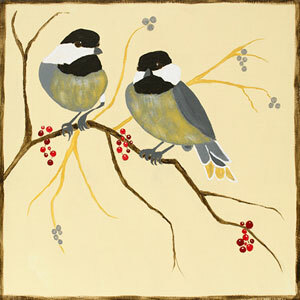 Join us as we paint them with berries on a 12x12 canvas that is perfect for keeping or giving this holiday season! Guided instruction walks you through the project, so it is perfect for anyone wanting to get over the fear of putting paint to canvas. Our state bird looks so colorful in winter. 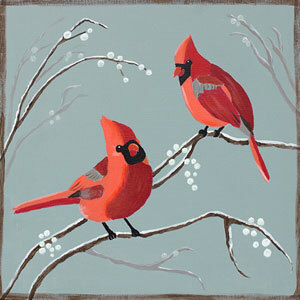 Join us as we paint them with berries on a 12x12 canvas that is perfect for keeping or giving this holiday season! Guided instruction walks you through the project, so it is perfect for anyone wanting to get over the fear of putting paint to canvas. 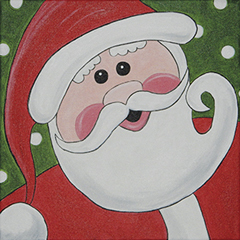 Parents enjoy a night out without the kids as they join us and paint Jolly Santa on a 12x12 canvas! Guided instruction walks you through this project, so it is perfect for anyone ages 5+. Cookies, punch, and hot cocoa will be served. This wooded winter wonderland looks like an inviting place to take a walk during the short daylight hours. Can't you just see the prints your boots will leave behind, winding their way through the evergreen forest? 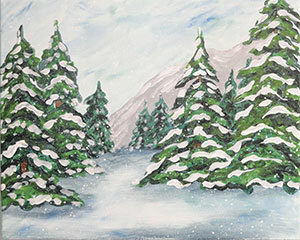 This tranquil scene that will look right at home in any winter decor. Guided instruction walks you through the project, so it is perfect for anyone wanting to get over the fear of putting paint to canvas. Kids' Painting Party / Parents' Afternoon Out — Give Thanks! 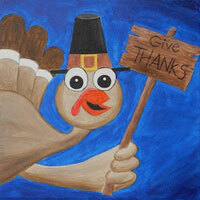 Join us as we paint Givvy the Gobbler on a 12x12 canvas! Guided instruction walks you through this project, so it is perfect for anyone ages 5+. Light refreshments will be served. 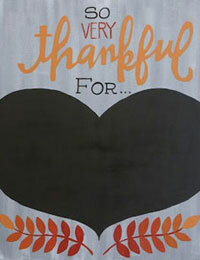 Our blessings abound this Thanksgiving season and this lovely chalkboard canvas allows you to display what you are thankful for all year round! Guided instruction walks you through the project, so it is perfect for anyone wanting to get over the fear of putting paint to canvas. Kids' Painting Party / Parents' Afternoon Out — Fuzzy Spider! 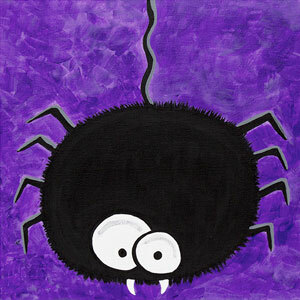 Join us as we paint the adorable fuzzy spider on a 12x12 canvas! Guided instruction walks you through this project, so it is perfect for anyone ages 5+. Light refreshments will be served. Join us as we relax and paint a gentle nod to Vincent Van Gogh on a 16x20 canvas. Guided instruction walks you through the project, so it is perfect for anyone wanting to get over the fear of putting paint to canvas. Space is limited to 16 guests and pre-registration is required. Kids' Painting Party / Parents' Afternoon Out — Boo! Tis the season of ghosts and goblins! 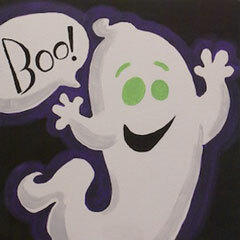 Join us as we paint the adorable ghost on a 12x12 canvas! Guided instruction walks you through this project, so it is perfect for anyone ages 5+. Light refreshments will be served. Join us as we paint this colorful autumn tree and sunset on a 16x20 canvas. Guided instruction walks you through the project, so it is perfect for anyone wanting to get over the fear of putting paint to canvas. Fall is our favorite time of year at The Mayflower Arts Center... crisp air and beautiful falling leaves. 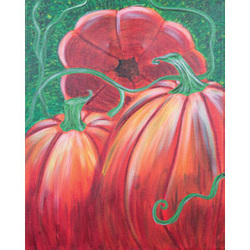 Join us as we paint this colorful pumpkin patch on a 16x20 canvas. Guided instruction walks you through the project, so it is perfect for anyone wanting to get over the fear of putting paint to canvas. Sqweeeeee! 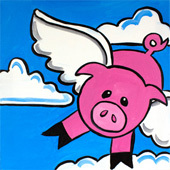 Join us we paint this flying pink cuteness on a 12x12 canvas! Guided instruction walks you through this project, so it is perfect for anyone ages 5+. Light refreshments will be served. We are not ready to let go of summer just yet! 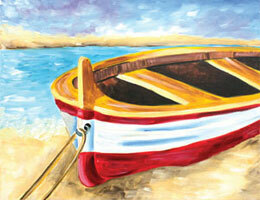 Join us as we paint this gorgeous beached boat on a 16x20 canvas. Guided instruction walks you through the project, so it is perfect for anyone wanting to get over the fear of putting paint to canvas. What climbs trees and chirps, but doesn't have feathers? TREE frogs! 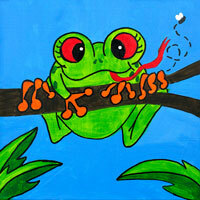 Join us we are going to paint this cute little amphibian on a 12x12 canvas! Guided instruction walks you through this project, so it is perfect for anyone ages 5+. Light refreshments will be served. 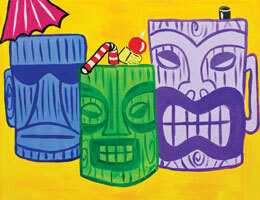 Summer may be nearing and end, but we are hanging on with these fun, tropical tiki drinks on a 16x20 canvas—grass skirts are optional! Guided instruction walks you through the project, so it is perfect for anyone wanting to get over the fear of putting paint to canvas. Bring your own snacks (no alcohol please). 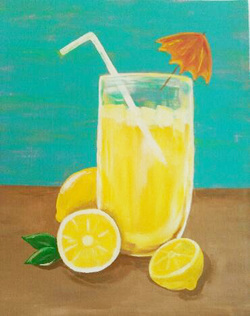 We'll have one last hurrah before school starts and enjoy the slow summer sun with a tall glass of lazy lemonade on a 16x20 canvas. Guided instruction walks you through the project, so it is perfect for anyone wanting to get over the fear of putting paint to canvas. Bring your own snacks (no alcohol please). Butterfly kisses are so tender and sweet... they make you feel tickled from your head to your feet! 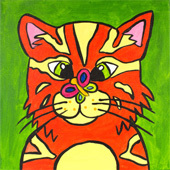 Join us we are going to paint our very own kitty cat and butterfly on a 12x12 canvas! Guided instruction walks you through this project, so it is perfect for anyone ages 5+. Light refreshments will be served. *Parents... while your kids are having fun with us, enjoy the Summer Music Series next door on Prouty Plaza featuring The Floorwalkers! The concert is free and presented by Troy Main Street, with music beginning at 7:30pm. 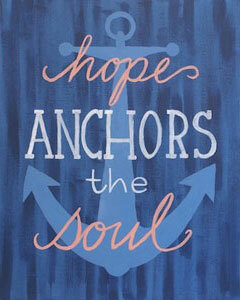 Join us as we paint this nautical theme of hope on a 16x20 canvas. Guided instruction walks you through the project, so it is perfect for anyone wanting to get over the fear of putting paint to canvas. Bring your own snacks (no alcohol please). We're celebrating cooking, scrumptious food, and those who love to prepare (and eat) it! This fun painting is 'tellement parfait' to give as a gift or keep for yourself. Guided instruction walks you through this project, so it is perfect for anyone wanting to relax and have fun painting on a 16x20 canvas. Bring your own snacks (no alcohol please). 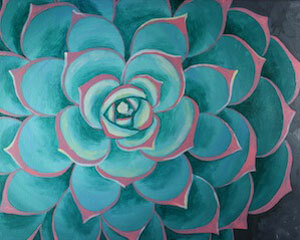 Join us as we paint soothing summer succulents on a 16x20 canvas. Guided instruction walks you through the project, so it is perfect for anyone wanting to get over the fear of putting paint to canvas. Bring your own snacks (no alcohol please). Kids' Painting Party / Parents' Night Out* — Surfs Up! COWABUNGA! 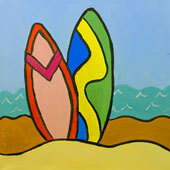 The tide is in and we are ready to paint these colorful surfboards on a 12x12 canvas! Guided instruction walks you through this project, so it is perfect for anyone ages 5+. Light refreshments will be served. *Parents... while your kids are having fun with us, enjoy the Summer Music Series next door on Prouty Plaza featuring American Kings in concert, performing "Elvis, The Beatles & Everything In-Between!" The concert is free and presented by Troy Main Street, with music beginning at 7:30pm. 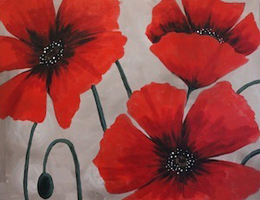 Join us as we relax and paint a pretty poppy trio on a 16x20 canvas! Guided instruction walks you through the project, so it is perfect for anyone wanting to get over the fear of putting paint to canvas. 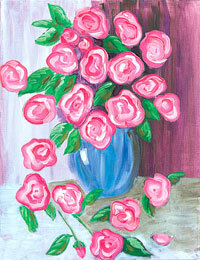 Who doesn't love the look of fresh roses in a vase! Guided instruction walks you through this project, so it is perfect for anyone wanting to relax and have fun painting on a 16x20 canvas. Bring your own snacks (no alcohol please). 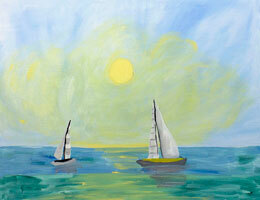 Even if you don't own a boat, you can definitely pretend you are relaxing at sea and paint your own sailboats on a 16x20 canvas! Guided instruction walks you through the project, so it is perfect for anyone wanting to get over the fear of putting paint to canvas. Bring your own snacks (no alcohol please). This is the stuff summer dreams are made of! 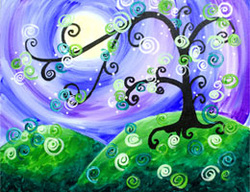 Join us for a relaxing evening while we paint this whimsical tree on a 16x20 canvas! Guided instruction walks you through the project, so it is perfect for anyone wanting to get over the fear of putting paint to canvas. Bring your own snacks (no alcohol please). Go Strawberries! It's Strawberry Festival Weekend in downtown Troy and what better way to celebrate than to relax and paint these mouthwatering strawberries on a 16x20 canvas! Guided instruction walks you through the project, so it is perfect for anyone wanting to get over the fear of putting paint to canvas.Bring your own snacks (no alcohol please). 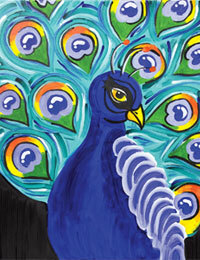 Join us as we relax and paint this pretty peacock with iridescent blue and green plumage on a 16x20 canvas! Guided instruction walks you through the project, so it is perfect for anyone wanting to get over the fear of putting paint to canvas. Bring your own snacks (no alcohol please). Did you know water lilies are a symbol for renewal? 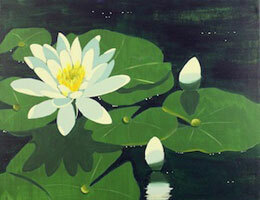 Refresh your soul and join us as we relax and paint these peaceful, fragrant water lilies on a 16x20 canvas! Guided instruction walks you through the project, so it is perfect for anyone wanting to get over the fear of putting paint to canvas. Bring your own snacks (no alcohol please). Summer is approaching and we are deep in the dreams of fragrant flowers, frogs signing in the pond, and dragonflies a'buzzin among the reeds. 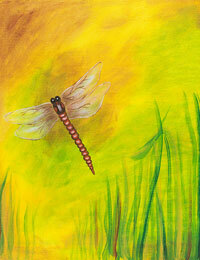 Join us as we relax and paint a whimsical dragonfly on a 16x20 canvas! Guided instruction walks you through the project, so it is perfect for anyone wanting to get over the fear of putting paint to canvas. Bring your own snacks (no alcohol please). Mom, bring your child to our special painting afternoon and create this adorable mother owl & owlet pair on a (2) 11x14 canvases! Have more than one child? We can easily expand the design to include additional 11x14 canvases! Guided instruction walks you through this project, so it is perfect for anyone ages 5+. Light refreshments will be served. Space is limited to 16 guests and pre-registration is required. SOLD OUT! Kids' Painting Party — It's Mother's Day and I Love Mom! 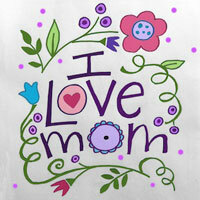 Come help us celebrate Mother's Day and paint your love on a 12x12 canvas just for Mom! Guided instruction walks you through this project, so it is perfect for anyone ages 5+. Light refreshments will be served. 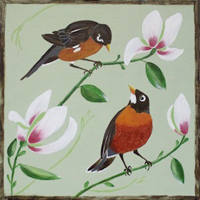 Join us as we paint pretty robins perched on magnolia tree branches (12x12 canvas). Guided instruction walks you through the project, so it is perfect for anyone wanting to get over the fear of putting paint to canvas. Can you think of a million reasons everyday why you love your someone special? 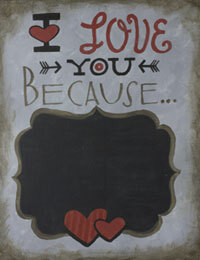 Now you can share them on a 16x20 hand-painted canvas! Guided instruction walks you through this easy project, so it is perfect for anyone wanting to get over the fear of putting paint to canvas. Love is definitely in the air! 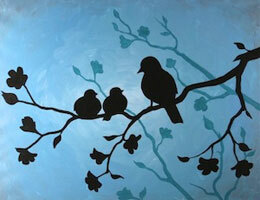 Join us for a special Couple's Night as we paint a romantic lovebird tree. You can even "carve" your initials on the trunk! Guided instruction walks you through the project, so it is perfect for anyone wanting to get over the fear of putting paint to canvas. Kids' Easter Painting Party — Hippity Hop! Easter is just around the corner and you know what that means? We get to paint cute Mr. Easter Bunny on a 11x14 canvas! Guided instruction walks you through this project, so it is perfect for anyone ages 5+. Light refreshments will be served. It's time to say "So long, Winter...Hello, Spring!" 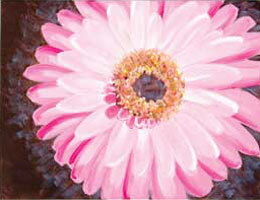 Join us as we relax and paint beautiful gerbera daisies on a 16x20 canvas! Guided instruction walks you through the project, so it is perfect for anyone wanting to get over the fear of putting paint to canvas. A sure sign of Spring is the beautiful bloom of the forsythia bush. Join us as we relax and paint this Easter emblem on a 16x20 canvas! Guided instruction walks you through the project, so it is perfect for anyone wanting to get over the fear of putting paint to canvas.